I’d been contemplating an 18w build lately. I built one years ago with the intent to sell, which I did. I’d heard one of the original combos many years ago and fell in love with the tone. 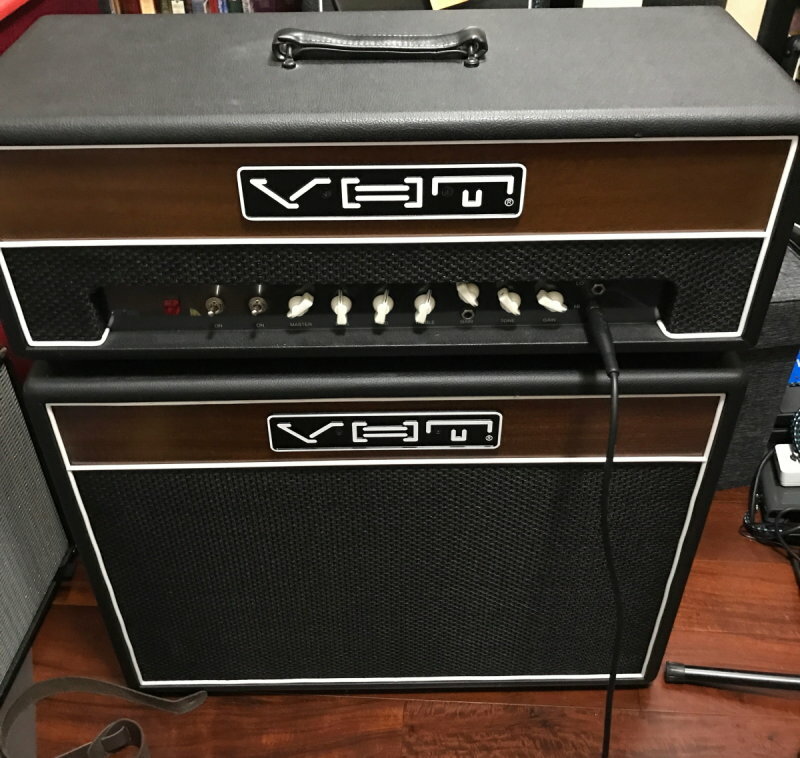 I just found a minty VHT Standard 18 head on Reverb for a very nice price. I still tossed an offer and he accepted. I’m stoked as I really love the Marshall 18w TMB tone. Sounds cool. Are you going to modify this amp? I'm not sure because of the "build" reference. I have no plans too. What type of cab would you use with this head Leftee? Right now my only cab - a 1x12 with an Eminence Maverick. Well, this is not working out. The amp came today. The guy did an utterly craptastic job packing it. He even stuffed some knitted scarves in the box for padding. The amp was still pretty loose. A foot was broken off in shipment. And the amp is DOA. Ouch, what a mess. I hope you have some recourse. I once bought a pair of pristine EV SRO-8L speakers on the bay. Even before I bid I asked if the seller would follow my packing instructions when shipping. I enclosed a copy. He said yes. I even offered to send him the packing material, boxes etc. He declined the packing stuff as un-needed. I won the auction and paid and reminded him of the packing instructions. The she speaker where loosely bolted together with 1/4 inch hardware that came apart in the single box filled with crumpled newspaper. The bolts came off, the speakers where beat up badly. Coil rub, broken connectors and huge missing paint. Totaled loss. The seller quit ebay, Paypal would not pay me back but the post office honored my claim as the speakers broke through the box in part. I got very lucky. Again, best of luck with the seller. Well... all's well that ends well. I got a hold of the seller through Reverb. He was very concerned and responsive. I had gone through all the obvious things with no luck. I was headed towards a refund and return because I just didn't want more work on my bench now. Especially right now. But I went ahead a pulled the chassis. First - this is one of the hand built models. The guts and eyelet board are impressive looking! I found that the hot wire from the back of the power plug to the tag board that feeds the PT was off at the tagboard side. I’m guessing (since it was a tight fit) that the wire connector was not fully pushed on the spade when the amp was built. UPS did the rest. He was super nice and he refunded me $25 for the feet and my hassle. All is good! This really scratches the itch for an 18w. I was seriously on the path to build one. This one is all it needs to be. And I got out a *lot* cheaper than building one. I'm prowling Reverb, last week, and what do I find? A 30% off sale on Panama cabinets. So I ordered this one with a WGS ET65. These cabs also come with a 3 stage attenuation built in. I haven't looked into what this circuit is (guessing it's just resistive), but it does work pretty well. It's not a whisper amount of attenuation, but it makes the cranked amp bearable - and it sounds good. This is an awesome little mini-stack. This cab color scheme is what they called mango sunburst. It has a nice grill, but I like it better like this. That and the cat is declawed. Dude, you've got the FEE-vah! This rig has shaped up nicely. I have found that the highest attenuation setting knocks too much of the goodness out of the tone. That's pretty typical. A while ago I bought a Supro Fuzz on a SDotD. It sounds absolutely glorious through this rig. I went ahead and retubed this amp a few days ago. It still had the original Chinese tubes installed from 2010. I know the amp had some hours on it and, in fact, the EL84s had that toasty look to them. I also have a NOS 5Y3 so I changed that as well. I have a Mullard 12AX7 reissue (long plate) which is now in V1. The net result is the amp is a bit more... “more.” Nice chimey articulation. The amp is a bit more lively, overall. I went and looked at those cabinets. Pretty nice! I do like the attenuator idea. Thanks a lot for giving me more GAS. I really like this cab a lot. One thing that’s hard to see in the picture is that it is a deep cab. It has a big tone for a diminuative size. Call me crazy, but I ordered one of their 4x8 cabs. I wanted something bigger and different for my Jet City 5/2 Head. I found a matching 2x12 cab (G12Hs loaded) on Reverb. It was NOS and had been listed for 2 years. Offer accepted, and it's mine. I spent some time with this rig and my new SG (thread in Lefty forum). Man this rocks! I wandered away from the G12H a few years ago. They’re back to stay!